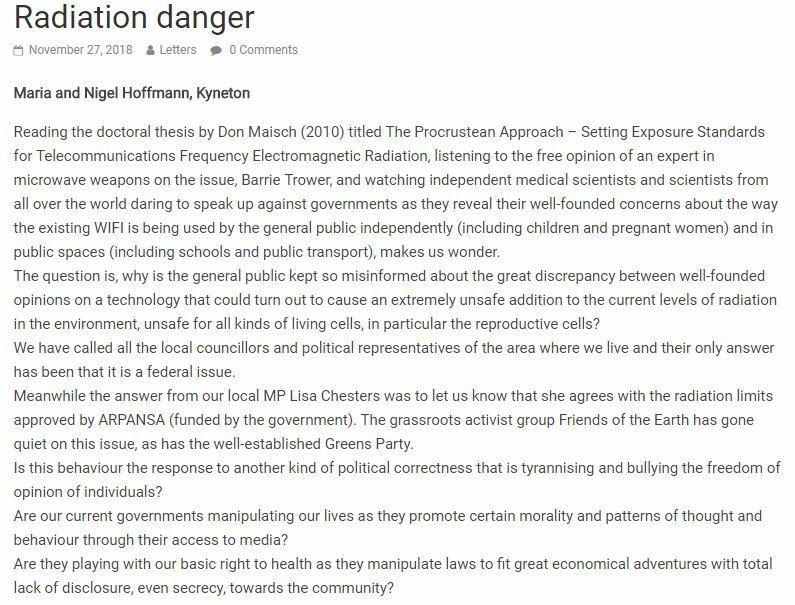 This entry was posted in Radiation, Smart Meter, Wi-Fi and tagged Australian Radiation Protection and Nuclear Safety Agency, Electromagnetic radiation, Smart meters, WiFi. Bookmark the permalink. 9 Responses to Why is the general public kept misinformed? Yes. Corporations exert a huge unseen influence over the political landscape. What can I do to shield my family from the wi-fi in my house? Can I get a wired connection to the computers in the house? Can you get a barrier between a smart meter on the outside of the wall, and the bedroom behind it? Where do you get it? When a new technology comes a long there is a social dynamic that sways people in favour of it, irrespective of whether it may be good ,or deleterious to health. This dynamic is all about not wanting to be seen as behind the eight ball, not with it. In the context of wireless technology it is the sort of folly that can lead a people like lemmings, to mass destruction. We have lost representation in Parliament and there are no wise elders governing anymore. Corporations have taken over the system of governance, so it is now representing Them. Yes, they have got it all their own way. The soft kill is in full swing, these (((globalists))) want us ignorant, sick, childless and dead, plain and simple. They feel the world is overpopulated and have been working covertly for decades to enact every nations destruction and usher in their new world order. In the next few decades they want 90% of us gone, technology will run everything and we will be their eternal slaves. Begging our masters to stop never works, we either fight or die, simple. I don’t think the government are the ones really in charge. All the policies are coming out at the global level which means there is a level above governments. If you want to know how the system really works, investigate the Rothschilds and you will find a goldmine of information there. They get paid. It’s all money these days. The more they get paid, the more quiet they go on the topic. Whatever topic it is, the more funds they get the quieter they get, the less the public know about the problem. Look at Smart Meters. WE KNOW they are a huge problem but the public doesn’t know anymore, There is a ban on speaking about smart meters. When there is a house fire there is a ban on the firies speaking about anything to do with smart meters. If they think it was caused by the smart meter they cant say it, Its now classed as “unknown source”. Same as the immigrants terrorising Melbourne. They get away with lots, even murder and nothing happens. The government denies there is a problem but the public knows there is a problem but the media is quiet on the subject. The less the media know the more in control the government is, the more they can keep doing their corruption and the less change of a revolution.